Outlander author Diana Gabaldon has received an award for boosting Scottish tourism through her fantasy saga. Outlander news from Private tours Edinburgh . The US writer, 67, received an International Contribution to Scottish Tourism award at the Scottish Thistle awards. It comes as VisitScotland published a paper detailing how sites used in the TV adaptation have seen visitors soar. The report says that set-jetting is a growing trend in Scotland, partly due to the “Outlander Effect”. Ms Gabaldon has told in many interviews how she was inspired to write the Outlander series after watching an old episode of Doctor Who. Her lead character Jamie Fraser is based on the kilted companion Jamie McCrimmon, played by Frazer Hines, who appeared during the Patrick Troughton doctor era. Outlander follows a romance between Jamie, a Highland poacher and Claire Randall, a World War Two nurse who is catapulted through time to the Jacobite era. 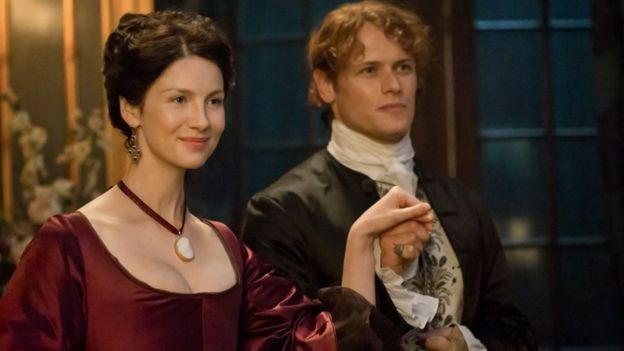 It was adapted for TV in 2014 for US network Starz, with Sam Heughan and Caitriona Balfe in the lead roles. Filming continues to be based in Scotland, with many Scottish locations doubling as France, the Caribbean and North America. On receiving the award, Ms Gabaldon said: “It’s fabulous. I hear a great deal from fans of mine who have read the books and seen the TV show, who come to Scotland because they all write to tell me how wonderful it was and they send me souvenirs of their trips. The Outlander Effect and Tourism paper, published on Thursday, reports that attractions that appear in the Outlander TV series have seen visitor numbers soar by 67% since 2013, from 887,000 to 1.5million. Doune Castle, near Dunblane, which doubles as the programme’s Castle Leoch, has seen the largest surge – 226.5% between 2013 and 2017. Numbers at Blackness Castle, near Linlithgow, which features as Black Jack Randall’s headquarters, increased by 181.7%. And Glasgow Cathedral’s visitors increased by 66.8% after it was screened as a French hospital. All Scottish visitor attractions were surveyed to discover how screen tourism and Outlander has impacted on their business. Almost all respondents considered screen tourism as positive for the industry and a fifth of attractions located next to filming locations said they saw an increase in visitors. Malcolm Roughead, chief executive of VisitScotland, said: “The impact of Outlander on Scotland has been truly extraordinary. “It has been amazing to see the global reaction to Diana Gabaldon’s stories of adventure, romance and Scottish history – and the subsequent television adaptation – and seeing it translate into visitor growth for Scotland.